The story of May Morn Estates (NZ) is a fascinating tale of gullible investors, the construction of a light railway and how New Zealand came close to loosing the Akatarawa Forest with major erosion problems today. The formation of the Maymorn light railway is reportedly still walkable today. I have not done so yet but it is on my list of things to do. When I make the walk I will document it here. Download my May Morn Estates research notes. 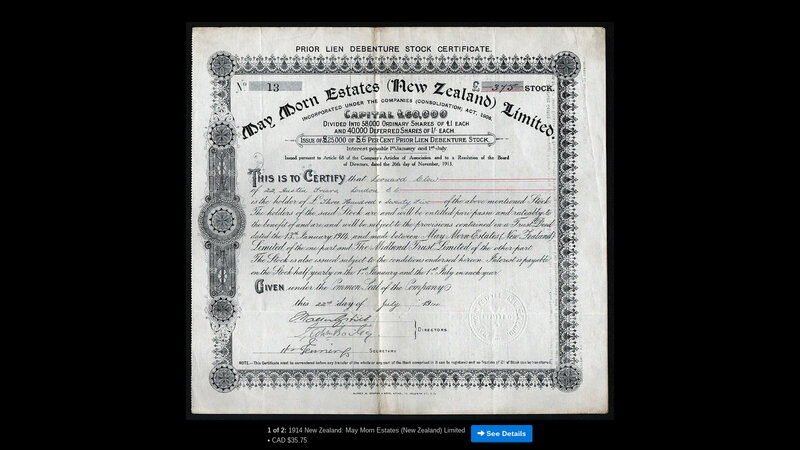 Here is a brief chronology of May Morn Estates (NZ) Ltd.
1886 Lawyer Tudor Atkinson set up business as a money lender. 1902 Atkinson was part a a central North Island logging syndicate that planned to build a 40 mile light railway from the bush to Putararu. The newspaper report of the scheme used similar gushing tones as the prospectus of the later May Morn Estates scheme. 1907 tenders were called for stage 1 of a tramway at Kaitoke. Atkinson was involved. 1912 May Morn Estates (NZ) Ltd was floated in London. Share capital was 60,000 pounds and first mortgage debenture stock 30,000 pounds. 90,000 pounds is worth approximately $15M in 2017. The company purchased 16,000 acres in the Akatarawas that became known as the May Morn Estate. The land was originally part of the Wellington and Manawatu Railway endowment. It also purchased 34 acres in the Mungaroa valley for a mill. I do not know who had financed the operation until this point. (Atkinson????). The company prospectus makes interesting reading. In hindsight the investors were gullible. The company prospectus referred to the tramway as a light railway and suggested that it would ultimately connect with the North Island Main Trunk at Otaki. An Improved Barclay-Meyer locomotive Joan was operated on the railway which, crossed the Hutt River on a large wooden bridge near today's Twin Lakes. 1914 Operating funds could no longer be cabled from London due to war censorship of coded cables. The bank refused to provide funds based on uncoded cables. Operations at the mill ceased immediately. In August 1914 the company ceased trading operations. 1915 The mill was being dismantled. Tenders were called for the purchase of the Band Saw Mill Plant. The cost of transporting logs to mill was too high. It was not possible to supply sufficient logs to keep the mill fully operational. The Army leased land and buildings for a few months for an overflow camp. 1919 Equipment from Maymorn Mill reported to be in use at Tauriko. 1921 Receiver appointed by debenture holders. All of the Company's money had been spent on development. On closing down it was left with the land and the continuing liability for rates and taxes. 1920s - 1940s Logging of the Akatarawa Forest continues. Public concern at denuding of Akatarawa forest. Concern at silting of the Hutt River. There were various attempts to sell the land, either by public auction or to the Government. 1937 Alfred Walker and ?? Walker (as mortagees) became joint owners of the May Morn Estates land. 1939 Bridge over Hutt River damaged by a flood - four of the eight spans of the 80 foot high bridge were destroyed. In 1944 tenders were called for the Purchase, Demolition and Removal of the remaining spans. The bridge was built of dry heart totara and Australian heartwood in large sizes. 1940 Minister of Scenery Protection and Commissioner of Forests makes scathing comments about Tudor Atkinson. He said that the government would not help investors who had dug a hole for themselves. The receiver had not been able to sell the May Morn Estate because the asking price was too high. Reports by Government officials stated that the land was suitable for conservation purposes, not logging. 1943 The Akatarawa Sawmilling Company (ASC) entered into an agreement for logging rights in the Southern (Hutt) block but the document was not properly executed. 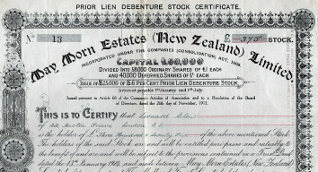 1948 Tenders were called for the purchase of the Northern (Otaki, 10,985 acres) and Southern (Hutt, 7756 acres) blocks. 1949 A tender for the purchase of the whole area lapsed due to complications which arose due to the cutting rights that the ASC alleged they held over the southern portion of the property (Arthur Seed's words). ?? Walker, as surviving mortagee, sought an injunction in the Supreme Court to restrain ASC from continuing cutting. Gresson J (read that as Mr Justice Gresson) declined the application. The impression I have is that Arthur Seed was trying to wriggle out of commitments he had made to the ASC, perhaps under pressure from the mortagee in London. Just prior to the injunction hearing a private out of court settlement had been reached with the ASC who purchased the freehold of the the southern (Hutt) block (7,756 acres) at a price satisfactory to the vendors. 1950 Arthur Seed was the NZ Attorney for the receiver. He was still trying to sort out the mess. Negotiations were underway to sell the Northern (Otaki) block (10,985 acres) to Odlins. Government officials believed that the May Morn Estate should be purchased for conservation purposes, but not at Seed's asking price. The sale of 10,985 acres to John Odlin & Co Ltd was complete by October 1950. 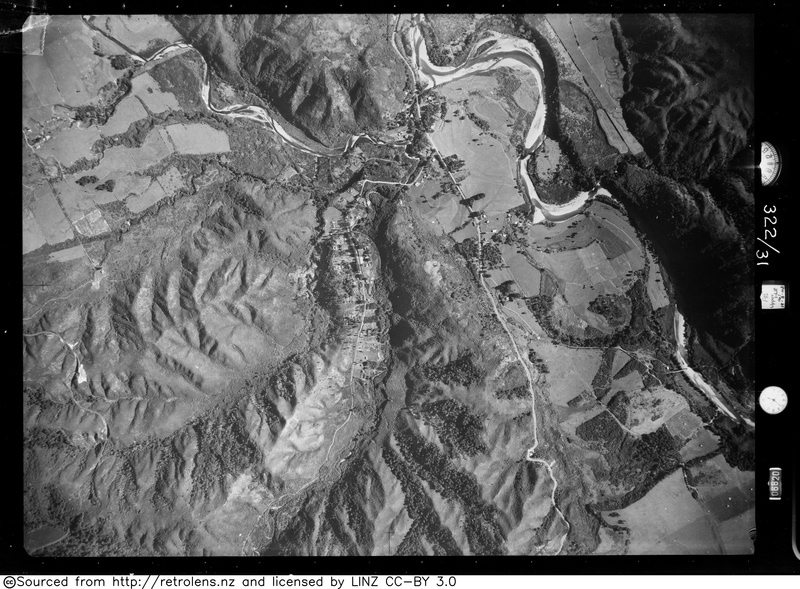 1951 The Wellington City Council gave notice of its intent to take 3235 acres of ASC land for water suppply purposes. The ASC and the Council could not reach agreement on the value of the land. The Forest Service was engaged to value the land. The permission of the Hon Minister of Forests was required to undertake this work. The Forest Service considered buying the remainder of the ASC land but the asking price was too high. It was suggested that they bide their time and wait until the ASC was fed up with paying rates. The change of land ownership in the 1950s period requires further research. 1954 All assets had been sold and had realised insufficient to meet claims and prior charges in full. 1958 Company struck off register. 2007 Land in the Akatarawa forest aquired under the Public Works Act 1981. Some land was for water supply purposes, other for conservation and was vested in the Greater Wellington Regional Council. I intend to include the the text of the company prospectus here. Untill I have typed it I will provide links to jpegs of the document. The prospectus is highly recommended reading! Have a look at the promises made to shareholders. I was unable to open the document completely flat for photography hence the substandard images. When I walk the rail formation I hope to record a kml file. In the meantime here is a plan showing the approximate route of the railway. The Damsite is the location of a proposed hydro electric dam on the Hutt River near Pakuratahi Forks (Kaitoke Waterworks). It is commonly called the Maymorn Tramway but the company prospectus called it a light railway and it was built to light railway standards. In 1948 the receiver was still trying to get the debenture holder's money back. This 1949 report from the State Forest Service to the Commissioner of State Forests is a handy summary of the situation. The National Archives and the Upper Hutt City Council Recollect sites have several photos claimed to be of the tramway bridge over the Hutt River. I believe that the bridge was in two parts - single deck with solid foundations over the river and double deck with driven piles on the eastern bank. First here is a Wide Angle view looking north-east with the tramway bridge on the left background and the Main Coach Road (now SH2) on the right. The confirms that the bridge over the river is a single deck truss. The next four photos show a bridge that is consistant with the one in the wide angle view. Bridge 4 Taken by local resident May Poulson. Here are two photos also taken by May Poulson, this time of a double deck bridge with driven piles. In this photo of the Rails removed (also by May Poulson) the bridge structure cannot be seen. The explanation can be seen in the Bridge 2 photo which confirms that the bridge was single deck over the river and double deck on the eastern bank. Zoom in and you will note that where the bridge disappears behind the vegetation the lower tension member changes from what looks like a steel rod to a wooden beam. On the far right, in the vegetation, diagonal braces can be seen. Both of these are consistant with the double deck bridge. I believe that the Double Deck bridge photo was taken on the eastern bank looking south. The construction of Twin Lakes in the 1970s(?) may have changed the eastern bank landscape beyond recognition. This photo of a Dodge truck driving over the Maymorn bridge doesn't help much. The lower bridge beam is timber not steel rod so it suggests that this is the double deck section. Unfortunately the foundations cannot be seen. 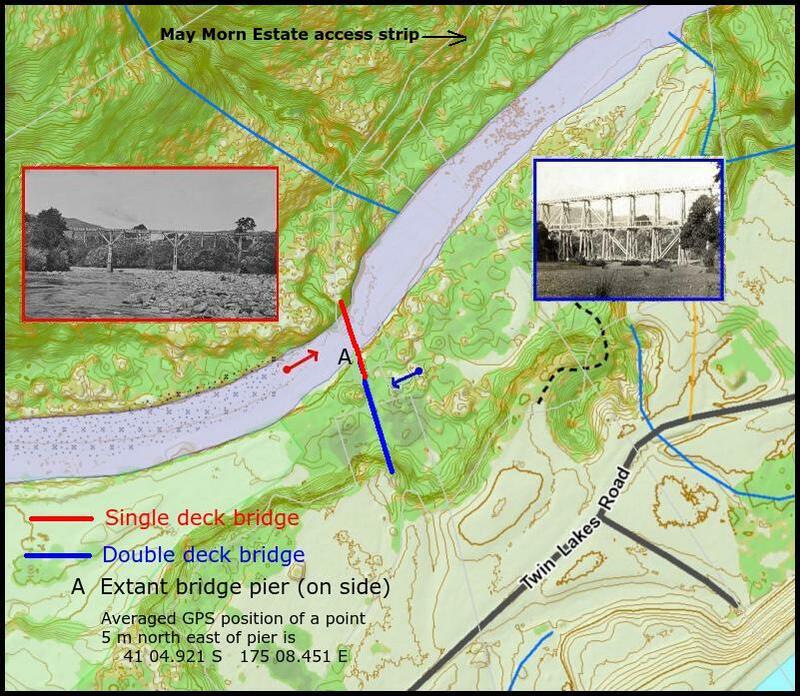 I have marked the bridge configuration on a GWRC LIDAR contour map. There is yet another complication. A report of the 1939 floods states that the private totara bridge leading to the Maymorn timberlands was 80 feet high and of eight spans. The two bridge photos suggests that it was of twelve spans. This 1943 aerial photo shows the alignment of the tramway through the twin lakes area. The photo confirms that half the bridge was over water and half over land.